In today's market it is fairly unusual to find a first person shooter which doesn't try to overload the player with a "meaningful" story line, a more realistic experience or numerous customization options for practically anything the player can think of. 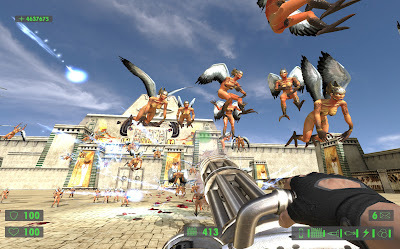 "Serious Sam HD: The First Encounter" is an exception which takes the player back to a time where the rule was "shoot everything you see, no exceptions" and although this doesn't take much thought it provides a fun and oddly refreshing experience. "The First Encounter" is set in Egypt with the plot revolving around collecting elements in order to travel back in time, a truly flawless storyline! Though the game may be lacking in the narrative department it makes up for it with the intense, non-stop gameplay which requires the player to stay focused if they want to stay alive. Staying alive provides a challenge with the game launching wave after wave of enemy forces at every turn. Enemies consist of horse-like skeleton creatures, soldiers with saw blades for heads, giant walking robotic brains with laser cannons, scorpions with machine guns and headless kamikaze soldiers, who comically scream as they charge towards you, and this is only naming a few. Sam is however well equipped to take on the variety of ludicrous enemies with an equally varied arsenal including shotguns, machine guns, lasers, canons and rocket launchers. Though there is about sixteen weapons in the game I found myself sticking to about four, with the others becoming more and more redundant as the game progressed. A lack of ammunition wasn't a problem for me however I can see it causing issues on the harder difficulties in the game. The game, however simple it may be, is most definitely not easy. The continuous bombardment from every direction requires quick reflexes so the player doesn't get overloaded by enemies who can deal fairly large chunks of damage at a time. 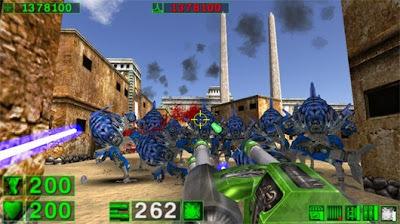 Trying to deal with enemies as soon as they spawn is the best plan of attack however they spawn so frequently that the player can often be overrun. On a couple of occasions I found myself being literally thrown around by countless charging bull type enemies leading to my inevitable death. "The First Encounter" seems to have a fairly even difficulty curve by which I mean it starts by sending multiple enemies at you and ends by throwing everything including the kitchen sink. However this onslaught or enemies can be tackles in a group of up to 16 players in co-operative play and although I didn't get to try this feature due to no-one being online, I can imagine it being amazingly good fun. The game takes most elements back to root level with health and armour packs dotted around each level as opposed to health regeneration found in most fps games today. Level layouts are largely liner with any tasks simply requiring the player to push buttons or find a key in order to progress. 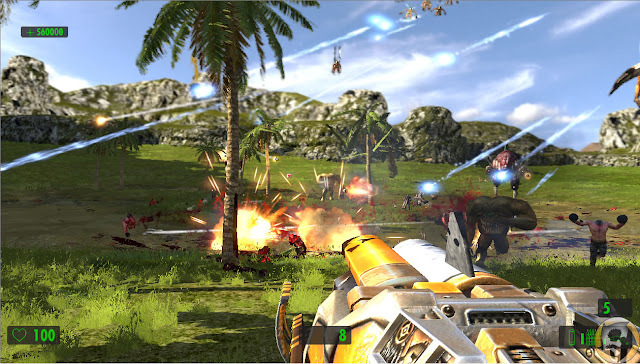 The fast paced "shoot on sight" gameplay takes centre stage however it does run the risk or feeling largely repetitive. Impatient gamers shouldn't be put of by this though as the game is one that you can simply dive in and out of at will. By the midway stage in the game the player will have seen practically ever enemy the game has to offer which does get boring, creating the feeling that you're merely fighting clones. Waves of enemies can become tiring when locked in a room or arena to do battle with the same enemy for minutes on end. However this is a HD remake much can be forgiven. The visuals in the game are impressive, especially when you look back to the original, which has not aged well, it shows what a good job the developers have done. Everything now looks bright, crisp and colourful which is exactly what you want from a HD remake. As with the co-operative play, I was unable to play the deathmatch mode due to lack of online users so I can't really comment on it. I imagine it would be very like unreal tournament or quake online and if the opportunity arises I'll definitely give it a go. As a newcomer to the series I would recommend "Serious Sam HD: The First Encounter". The old-school gameplay provides a solid adrenaline fuelled experience and though it is very simplistic and short in comparison to modern fps games it definitely holds its own. 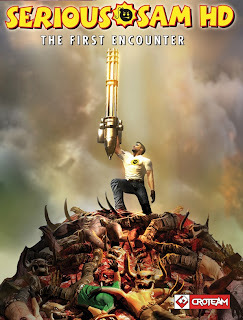 If you are looking for relentless action or simply just want to shoot things until they explode "Serious Sam" will deliver.